So I finished this quilt top on January 2, 2012. That's over 2 years ago. Is it just me or is it frightening how quickly the time passes? 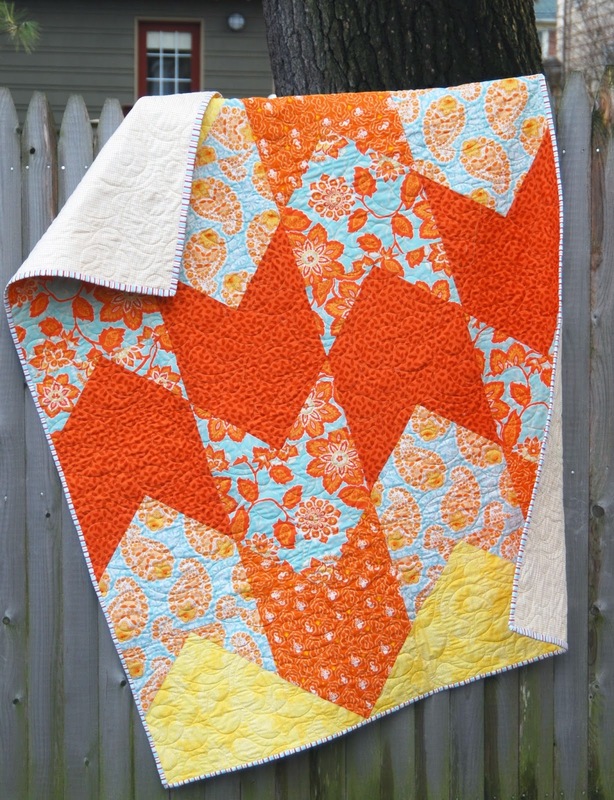 This was the first quilt that I used some of my very precious stash of Heather Ross Mendocino fabric for. Orange is my favorite color, so it was a big deal for me to cut into it. I am thrilled to finally be able to use this to keep me warm on the couch and see those seahorses every day! You can barely see them in the lighter orange arrows at the bottom and top. I am also on a striped binding kick. So what better choice than some Heather Ross stripes to finish this off? Now I'm back to the quilt that I'm making for our guest room. I started it last spring, and got sidetracked. What else is new? The big deal about this quilt is that it's full/queen size, which is the biggest top I've made to date.